The largest remaining stand of virgin bald cypress trees in the world grows in Corkscrew Swamp Sanctuary, and you can easily explore it on the miles of boardwalk that wend among the trees. No visit to Southwest Florida is complete without touring the magnificent sanctuary, nestled on 11,000+ acres of land, just 30 miles east of Naples. Many people who visit Corkscrew go back again and again. Corkscrew is known as the "crown jewel" of the National Audubon Society's sanctuary system and, with the recent addition of the Blair Audubon Center following a 10-year, $6.7 million fundraising effort, it has certainly earned its reputation. Six exhibits prepare you for your walk into the swamp. As you first enter into the "Swamp Sense Theater" with the moss-draped canopy overhead, you can see a replica of the boardwalk you will soon be touring outdoors. You can feel the coolness of the swamp as you hear a chorus of frogs, the screeching of a red-shouldered hawk, a thunderstorm approaching and the bellowing of an alligator. This 14-minute exhibit chronicles the yearlong cycle of water and fire in the ecosystem. A voice-over admonishes the crowd to be very quiet in order to hear all the sounds in the sanctuary. Executive Director Ed Carlson, who's been with Corkscrew for more than 30 years, said most of the swamp sounds were recorded within the sanctuary itself. "The exhibits don't replace the experience any more than a television program about the Grand Canyon substitutes going there. It makes you want to go and teaches you about what you'll see beyond the surface," Carlson said. There are 5 other exhibits, including "Clues to Below the Surface," which takes visitors below the "blackwater" for an understanding of our thriving underwater world where most of the swamp life lives. There's the "Deepen Your Swamp Sense" exhibit, complete with a 4,000-gallon aquatic world of crayfish, gar and other swamp creatures. 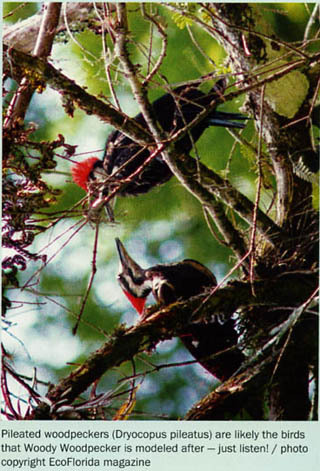 "Life in the Treetops" is an exhibit that places visitors in the crown of the old-growth forest. In "Heighten Your Swamp Sense," visitors get a sense of life in a wood stork nesting colony. And finally, visitors will be attuned to the "music" of the swamp with the calls of woodpeckers, barred owls and limpkins along the "On the Boardwalk" exhibit. In addition to the new center, other renovation projects include the first natural wastewater treatment plant in Florida, known as the "Living Machine," which was completed in 1994. Surrounded by a lush garden setting of native plants and butterflies, this machine consists of a linked series of biological communities that can purify up to 10,000 gallons of wastewater per day. This machine uses both sunlight and a variety of organisms in order to accelerate the natural processes while removing impurities from the water, of which 90% is recycled for use in the restroom toilets. The drinking fountains and sinks have a separate fresh line. As you proceed to the boardwalk, expect to see plenty of flora and fauna. This is a nature lover's dream come true. 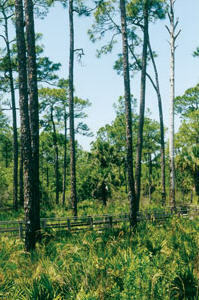 The boardwalk allows you to meander through pine flatwoods, freshwater marshes and prairies. Walk slowly and look all around; an owl may be sitting quietly above you, or a snake may be resting on branches a few feet from the boardwalk. The ancient bald cypress trees tower 130 feet or more into the sky and have a girth of 25 feet. In addition to the cypress trees, you can also see an abundance of slash pines, sabal palms -- our state tree -- and saw palmettos. Wax myrtle, sand cordgrass and buttonbush are also quite prevalent. A subtropical jungle awaits you, complete with ferns, wildflowers and air plants. Twelve species of air plants, all epiphytes -- those that grow on other plants -- can be viewed along the boardwalk. Spanish moss is also a familiar sight, as is the beautiful swamp lily. Numerous ferns can be found along the boardwalk, including Boston fern, strap fern, water fern and the resurrection fern. Nearly 200 species of birds live on the preserve, earning Corkscrew an international reputation among birders. Wood storks, which are endangered, nest high in the 500-year-old cypresses from March through May. Be sure to watch for anhingas, barred owls, egrets, herons, ibis and limpkins, to name a few of the more commonly seen birds. In addition to birds, you may see alligators, red-bellied turtles, white-tailed deer, the Florida black bear and river otters. The boardwalk winds through 2 favorite feeding grounds for wildlife, commonly referred to as "Lettuce Lakes" because of the vegetation that grows there. (When my husband and I visited Corkscrew in April, we were delighted to count 7 alligators, along with several turtles, in the Lettuce Lakes section of the sanctuary, where the water level was the lowest I had seen in my 20 years of living here.) And there are virtually no mosquitoes in this sanctuary due to the tiny mosquito fish that eat the mosquito larvae. If you don't want to walk the entire 2.25 miles of the boardwalk, you can take the shorter route running a mile in length. Before leaving the sanctuary, rest in the new tearoom and refuel with its scrumptious salads, sandwiches, coffees and cold drinks. Or simply relax on the back porch in the quaint rocking chairs. Don't forget to check out the nature store and art gallery, which are packed with everything from books for both adults and children to T-shirts and binoculars. There's quite a selection of pottery, walking sticks, backpacks, bird feeders, stuffed animals and greeting cards, in addition to artwork by famed black-and-white photographer Clyde Butcher (featured previously in our winter issue) and other artisans. Corkscrew Swamp Sanctuary was created in 1954 in order to protect the area from the booming logging industry. It was a remote wilderness that attracted fewer than 10,000 visitors per year. Most of the wild swamps -- and much of the wildlife characteristic of this area less than a generation ago -- have sadly disappeared. Almost 50 years later, however, the attendance has surpassed 100,000 and continues to grow each year. Today, the sanctuary is owned and operated by the National Audubon Society, whose mission is to restore and preserve the Everglades and the watershed to ensure a healthy ecosystem for generations to come. 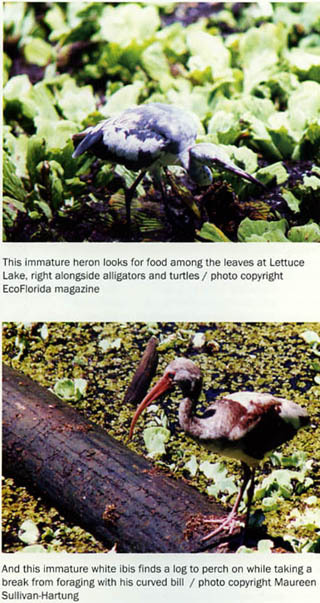 The Blair Audubon Center at Corkscrew Swamp Sanctuary is located at 375 Sanctuary Road, Naples, Florida 34120. Directions: Take I-75 to Exit 17 and drive 15 miles east. Corkscrew is open 365 days a year. Daily hours from May through November are 8 A.M. to 5 P.M. From December through April the daily hours are 7 A.M. to 5 P.M. Admission fees: $8 for adults, $5.50 for college students, $5 for Audubon members, $3.50 for children 6-18 and free for children under 6. And for groups of 10 or more, a Corkscrew naturalist guide can be reserved for a nominal fee. Call Brooke Langston at 941-348-9151 for more information. Trails are handicapped accessible and feature interpretive panels along the way. If you don't bring your binoculars, you can always rent them for a small fee. Wheelchairs and strollers are both available without charge on a first-come basis. And for those interested in volunteering, there are many opportunities available on a daily basis. 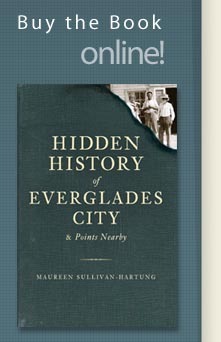 Naples freelance writer Maureen Sullivan-Hartung is a nature lover and also an Audubon member as well as a Friend of Corkscrew. She told us, "Everyone who comes to visit me in Naples always gets a tour of Corkscrew, the Naples Pier and the nearby Everglades. Southwest Florida's climate is totally different from our northern neighbors', and I want them to be able to see those differences. We do indeed live in a beautiful paradise."